To set the standard of support for our veterans, members of the armed forces and their families by engaging neighbors, business and organizations. Early one morning on Hunting Island State Park on the southeastern tip of South Carolina, Mike Dorman had a vision. The sun was coming up on the horizon, the waves were breaking on the shoreline and Michael, who had retired from the United States Coast Guard after 20 years of service, was in deep thought about his life. 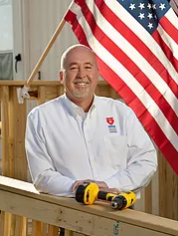 “I was thinking about growing up in North Carolina, my career in the Coast Guard and my time spent as a contractor after the Coast Guard, and I felt the need to do more with my life,” says Dorman who grew up in North Carolina. He was thinking about his fellow veterans, those injured while serving their country; veterans with disabilities who needed everyday assistance. Those thoughts early that morning led Mike Dorman to make major changes in his life to start Military Missions in Action in January 2008, devoting his efforts to help veterans with disabilities achieve independent living as well as supporting our service men and women serving in combat areas and their families.